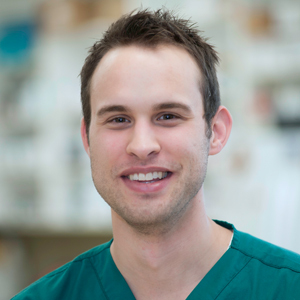 Dr. Nate Kleefisch obtained his Doctorate of Veterinary Medicine from Purdue University (2013). He began doing emergency relief work at AEC in 2015 and joined our staff full time in 2017. Dr. Kleefisch is a member of the MVMA, SEMVMA and AVMA. Dr. Kleefisch worked as a general practitioner in Southeast Michigan for three years before taking an interest in emergency medicine. His positive energy can be as uplifting for co-workers and owners as it is for their pets. Dr. Nate grew up with farm animals in Indiana and that led him to his career as a veterinarian: "One night my favorite cow had a calf. Shortly after birth the calf became very ill and the veterinarian was not able to help him - the calf didn't make it." After that experience Dr. Kleefisch committed to dedicate his time to ensure he is able to help each of his patients to get the best opportunity to overcome any challenge to obtain a good quality of life. Dr. Kleefisch has two cats, Meme and Felix, and is married with 2 children. He would love to explore more of Michigan through camping, and he would also like to travel to all of the Big 10 football stadiums to see his favorite teams play!